UA will hold its summer commencement ceremony Aug. 4. 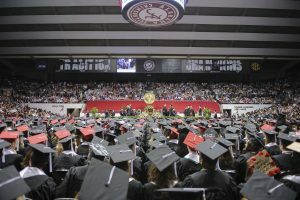 TUSCALOOSA, Ala. – The University of Alabama will hold its summer commencement exercise Saturday, Aug. 4, at Coleman Coliseum on the UA campus. UA is scheduled to award degrees to 1,450 students beginning at 9 a.m. Undergraduate and graduate students from all colleges and schools will participate in the ceremony, which should last approximately two hours. Among those who will be awarded a degree is C. Ray Hayes, chancellor emeritus of the UA System. Hayes, who has served the UA System for 12 years, including two as chancellor, will be awarded an honorary Doctor of Humane Letters. During Hayes’ chancellorship, the three System campuses achieved new enrollment and retention benchmarks and continued on a highly successful trajectory as a model for the nation in teaching excellence, scientific research and public service. Hayes is currently working on initiatives of importance to the UA System, with particular emphasis on challenges facing the health care delivery system, solutions to behavioral health issues affecting our state and nation, and collaboration with strategic System partners across the state. Dr. Steven H. Hobbs, the Tom Bevill Chairholder of Law at UA, will serve as commencement marshal. Hobbs received his undergraduate degree from Harvard University in 1975 and a Juris Doctor from the University of Pennsylvania in 1979. Hobbs joined UA’s faculty in 1997. More information, including parking and shuttle maps, can be found at https://www.ua.edu/commencement/. Additionally, the commencement ceremony will be broadcast live at this site.